We’re in the midst of an awakening in this country as it relates to our healthcare system. To most anyone who has spent time studying the state of affairs, it clear that we are falling behind other developed nations measured by both efficiency of spend and quality of care. In 1997, I wrote a research paper on this topic for a university course, in which I cited The World Health Organization and their ranking of the global healthcare systems of 191 member states. That ranking suggested that America’s healthcare system ranked 37th in overall quality, and 1st in per capita spend. The 37th ranking was subjective and debated. The 1st ranking was not. Since then, The Commonwealth Fund and Bloomberg have each published similar studies with similar findings. In their study, Bloomberg wrote that "the U.S. spends the most on health care on a relative cost basis with the worst outcome” of any developed nation. The gravity of the situation comes into focus upon realizing we spend 2x+ per capita more than the country who ranks 2nd, without better outcomes to show for it. The situation is felt acutely by businesses who bear much of the financial burden of our employer-sponsored healthcare system. The burden is felt in three primary ways: (1) fully loaded cost of providing sponsored or subsidized healthcare to employees (2) cost of annual premium increases levied by the health insurance companies (3) quality of care received from existing practitioners in the system. Cost of Healthcare - The average 1,000-employee company spends roughly $10 million per year on insurance for their people. Wrapped up in that cost is approximately $500 every time an employee visits their doctor’s office for a routine exam or checkup, which happens an average of 3.3 times each year. 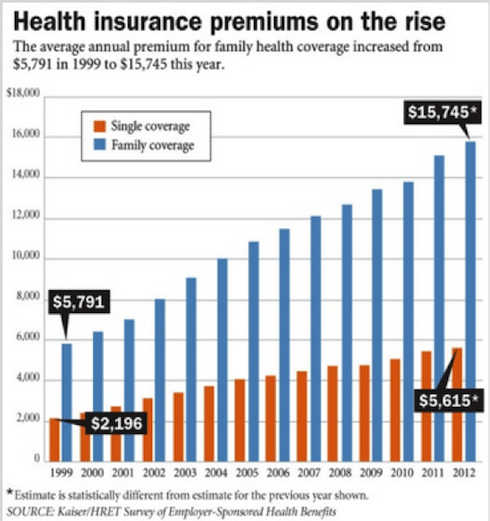 Premium Increases - Premiums continue to increase at rates of ~10% each year. (See chart below) For the same 1,000-employee organization in the example above, this can mean a $1,000,000+ increase in annual healthcare expense. This hit home for us in a very real way at SoftBank Capital this past year, as we watched our insurance provider try to increase our annual premiums by 20%! Quality of Care - By most accounts, one of the biggest drains on our healthcare system is excessive care - doctor's office visits, ER visits and tests that don’t need to happen. For your typical head cold or sore throat, there should be a better way to get the care you deserve that doesn’t require investing hours of your day scheduling an appointment and traveling to a doctor. In addition to a poor use of time, these visits have shown to spread germs and infection, often making the initial problem worse. We met Jay Parkinson a year or so ago, but he’s an entrepreneur we’ve been watching for some time. After finishing medical school and doing a residency in pediatrics and a master’s of public health at Johns Hopkins, he opted for the entrepreneurial path and began testing various hypotheses for delivering healthcare smarter. What began as a one-man mobile medical practice managed with an online forum and paypal account evolved into two companies - Hello Health and The Future Well. Two years ago, he and Cheryl Swirnow founded Sherpaa Health, his fourth startup and the accumulation of knowledge gained from the previous three. Jay has been thinking about this problem for more than a decade and he’s exactly the type of entrepreneur with whom we like to partner. Sherpaa is a healthcare platform designed for organizations of 250 employees and up that delivers higher quality care, better service while generating meaningful savings for its customers. By addressing 70% of health issues, Sherpaa can reduce the number of annual doctor’s office visits from 3 to 1. At $500 a pop, that’s $1,000 savings per employee. By diverting 70% of cases out of the traditional payer system, overall insurance claims drop, saving organizations lots of money and positioning them well when insurance companies come calling for premium increases. Sherpaa also delivers meaningful data, helping employers better understand their employee population. Meanwhile, it’s a perk that employees love - they get more attentive and nurturing care. That’s a win-win relationship, which is exactly why Sherpaa has never lost a customer. If you’re an organization with 250+ employees and struggling with the cost of health insurance, call Sherpaa. It’s a no brainer. We are thrilled to be leading Sherpaa’s Series A round of financing, as announced in the Wall Street Journal earlier today and by Jay on his blog here. We believe Sherpaa has a bright future ahead of it and look forward to a long and exciting road together.